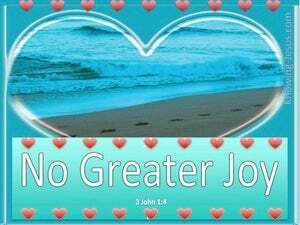 ﻿ 3 John 1:4 I have no greater joy than this, to hear of my children walking in the truth. I have no greater joy than this, to hear of my children walking in the truth. I have no greater joy than this: to hear that my children are walking in the truth. 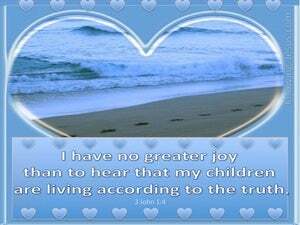 I have no greater joy than to hear that my children are living according to the truth. I have no greater joy than these things that I hear my children walking in truth. Greater joy have I none than this, to hear of my children walking in the truth. I have no greater joy than this, to hear that my [spiritual] children are living their lives in the Truth. I do not have any greater joy than to hear that my [spiritual] children are living according to the truth. I have no greater joy than to hear that my children walk in the truth. I have no greater joy than to have news that my children are walking in the true way. I have no greater joy than this, to hear that my children are walking in the truth. greater joy I cannot have, than to hear that my children are attach'd to the truth. I have no greater joy than these things that I hear of my children walking in the truth. I have no greater joy than that which I have when I hear my children are walking in truth. I have no greater joy than this, that I may hear of my children walking about in truth. I know of no greater blessing than hearing that my children are being guided by the truth. I have no greater joy than this, to hear that my children walk in the truth. I have no greater joy than this, to hear that my sons walk in the truth. I have no joy greater than these that I hear my children walking in truth. I have no greater joy than this: that I hear my children are walking in the truth. I have no greater joy than these things, to hear that my children walk in the truth. I have no greater joy than for to hear how that my sons walk in verity. I have no greater joy than to hear of my children living in the Truth. I have no greater joy than this, to hear that my children are passing their lives in the truth. I have no greater joy than this: to hear that my children are living according to the truth. I have no greater joy than this, that I hear of my children walking in the truth. 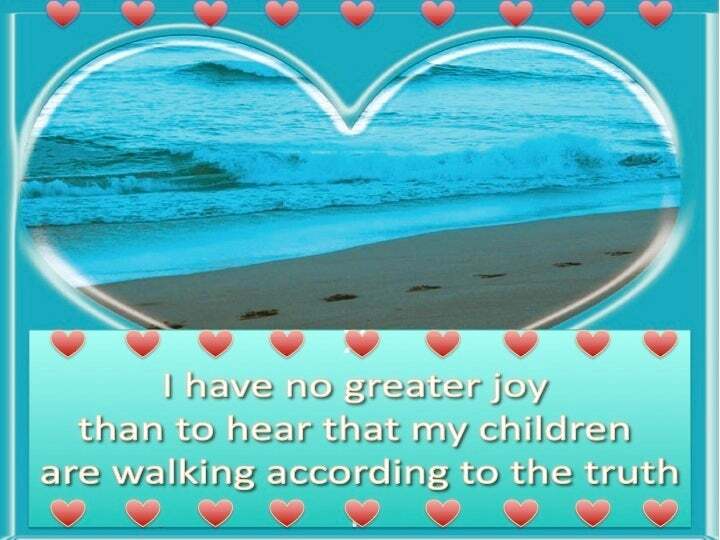 I have no greater joy than these tidings, that I hear my own children are walking in the truth. Nothing gives me greater pleasure than to hear from time to time that the lives of my Children are guided by the Truth. I have no greater joy than to hear that my children are living in obedience to the truth. I have no greater spiritual blessing than this, to hear that my children are living by the truth. 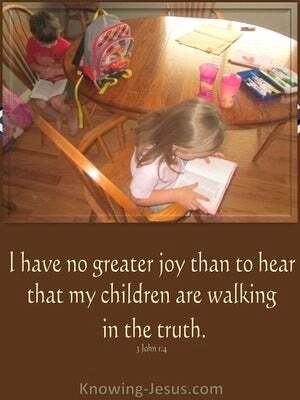 And I have no greater joy than to hear that my children walk in the truth. greater than these things I have no joy, that I may hear of my children in truth walking. But when I saw that they were not straightforward about the truth of the gospel, I said to Cephas in the presence of all, "If you, being a Jew, live like the Gentiles and not like the Jews, how is it that you compel the Gentiles to live like Jews? To Timothy, my true child in the faith: Grace, mercy and peace from God the Father and Christ Jesus our Lord. To Timothy, my beloved son: Grace, mercy and peace from God the Father and Christ Jesus our Lord. The father of the righteous will greatly rejoice, And he who sires a wise son will be glad in him. Behold, I and the children whom the LORD has given me are for signs and wonders in Israel from the LORD of hosts, who dwells on Mount Zion. and said, "Remember now, O LORD, I beseech You, how I have walked before You in truth and with a whole heart, and have done what is good in Your sight " And Hezekiah wept bitterly. So Jesus said to them, "For a little while longer the Light is among you Walk while you have the Light, so that darkness will not overtake you; he who walks in the darkness does not know where he goes. I do not write these things to shame you, but to admonish you as my beloved children.